The original article can be found online at https://doi.org/10.1007/s42360-019-00128-7. Unfortunately, some errors occurred in the article. Total thirty isolates were obtained from diseased samples of brinjal crop from all the locations i.e. Narkora in Budgam (PV1–PV8); Zazuna in Ganderbal (PV16–PV22); Palpora in Srinagar (PV23–PV27); Chadoora in Budgam (PV9–PV12), Lar (PV13–PV15) in Ganderbal and Tailbal in Srinagar (PV28–PV30). Some isolates namely PV8, PV15 and PV18 comprising of 10% of the total isolates showed more than two guttulae in their α-conidia. 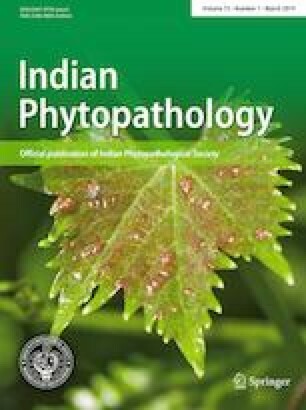 However, significant pathological variability existed based on the different response exhibited by brinjal lines to these isolates.